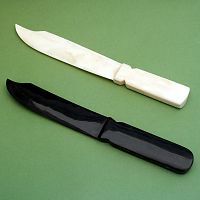 - Made entirely of bone (white) and horn (black), these ritual knives contain no metal, and do not have sharpened blades. Their purpose is to focus and direct your energy during ritual workings. The overall length of each knife is approximately 9". 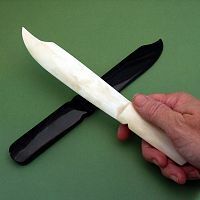 Expect minor variations, as these are handcrafted items. Set of two- one horn and one bone. Do you have any other questions about our Ritual Knives (Set of Two)?